Welcome to the hotel Bockmaier! Be welcome in our long established and traditionally rich house. 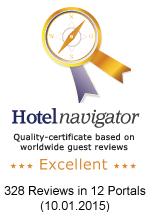 Our 3-star certified house is situated in a quiet neighbourhood only 16km south-east of Munich. No matter if you are visiting a trade fair, are here on buissness, as an assembler or for a short brake, in our hotel you can easily relax and reenergize after an exciting or busy day. Our family hotel is recommended by the ADAC and has 27 single- and double-rooms, in which you will feel comfortable. In Oberpframmern you can choose between four restaurants. In the small town there is also a supermarket, a beverage store and a gas station available. Because of the vicinity of our hotel to the city (Munich) all important traffic junctions are easily reachable. It takes only 20 minutes to reach the "Messe München" and in 30 minutes you can be in the center of Munich. Free parking space for our guests is directly in front of our house. We would be happy to welcome you in our hotel !